The future of design is uncertain, with technology gradually blurring the lines of ownership and creativity. So how do we look ahead? At the Design Thinkers track at TNW Conference, designers from all fields shared their experiences and visions for the future. Chris had large ambitions for his talk, which he shared with the crowd: “Thanks for coming out so early in the morning on day two of the conference. Hopefully I can bring some delight to your hangovers.” While a tall order, his talk certainly did delight. We’re kind of a big deal, which most people don’t realize. We’re the fourth largest site right now in the United States, according to Alexa. So why fix what isn’t broke? Chris explained that the website wasn’t as inviting for new users as it could have been, and that it’s important to update the code in order to remain clean and modern. He goes through each step of the design process, and at the heart of it is one main theme: iteration. From start to finish, Reddit involved their users in the redesign. This not only helped them improve their product, but it maintained the core value of community that the website aims to uphold. I think it just comes down to listening and iterating. Constant communication with users was key, because no one likes surprises. We involved our moderators and users in the beta launch, and we listened to their feedback. Of course, it wouldn’t be Reddit if there weren’t some pitchforks. But it’s amazing how if you actually listen to someone’s complaints and you fix them, they become your biggest fan almost overnight. Reddit is still busy rolling out the redesign to everyone, and Chris said that the next steps are to focus on designing for visual impairment and color blindness. “These were core focuses from the beginning, but we felt that it was important to first build a foundation before we could properly tackle them,” he told the crowd. You can watch his talk and learn more about the redesign steps. If you’re redesigning a website yourself, Chris shares a lot of great advice, and if you’re a Redditor like us it’s just cool to see an inside perspective. Purna explained that when designed right, conversational AI can make our lives easier. While we’re already making leaps and bounds, there’s a lot more we can do to make machines truly useful. It can also save businesses millions of dollars if designed with care. The right words can build engagement, trust, and enthusiasm for interacting with a bot. When designing language, you should write for the ear, not the eye. We talk differently than we write, so make sure that the conversation flows. When the bot gives choices to the user, you should limit it to giving three options. Any more will overwhelm the user. At the same time, the goal isn’t to make the user feel like they’re talking to a human. People are more comfortable and forgiving if they know they’re talking to a bot. Mistakes still happen, and the bot should be designed to say sorry — but not too much. It gets really annoying to hear the same ‘I’m sorry, I don’t understand’ message each time. Luckily, there’s more than one way to say sorry — my husband has certainly learned that. Purna explained the ‘sorry, not sorry’ method, which is essentially different ways to say sorry while still keeping the conversation flowing. She concluded her talk by giving an example of how conversational AI can be used by autistic children to express themselves. “Good design can break all barriers,” Purna said. You can watch her full talk above, to hear more about the four ‘C’s and her design advice. Computers will take over parts of the design process that we thought were sacred, only reserved for professional human designers. It works like evolution in nature. It generates thousands of prototypes and picks the best performing design, and then builds off of that generation until it reaches a final high-performing design for you to use. I’m not getting paid to say this, but I can honestly say that it’s changed the way I think about design. Things get really interesting when we combine performance-based generative design with neural networks. Artificial intelligence neurons can be trained to make aesthetic value judgements for you, based on what you like. It can even generate designs based on concepts like ‘retro’ or ‘modern.’ And it does this really fast, a million times, until it spits out what you want. We need to un-blackbox generative design. The best way to do this is if we all learned the basics of machine learning and AI concepts. This applies for everyone, not just designers. But for the designers especially, you could wait for the robots to steal your jobs, or you can become a robot tamer. Learn how to use generative design software — join the conversation, so you can steer it. You can watch Che-Wei’s inspiring talk above. 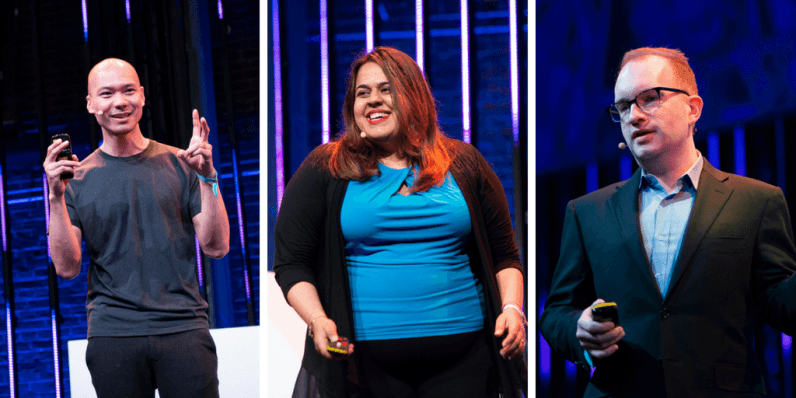 Our Design Thinkers track at TNW Conference featured many more speakers. You can watch all of their talks right here.